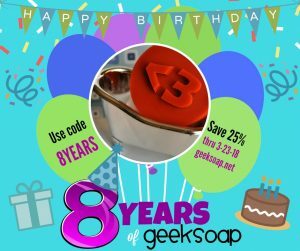 You are here : GEEKSOAP Blog Celebrating 8 YEARS of GEEKSOAP! HAPPY BIRTHDAY, GEEKSOAP! It’s hard to believe that I’ve been making GEEKSOAP for over 8 years! Let’s get real for a minute. If you had told me back then that I would still be running a successful small business handcrafting nerdy soap designs 8 years later, I probably would have laughed. But the truth is… I’m still here creating geeky soap art 8 years later ALL BECAUSE OF YOU. Yup, every single one of you. YOU are the reason GEEKSOAP continues to be successful, year after year. YOU are the reason I’m here. All of your orders, emails, and messages of love & support over the past 8 years are the reason I get to continue doing something that I love, and I’m eternally grateful for you and the opportunity to express myself through this soapy art form. To show my gratitude, I have a sale for you! Use code 8YEARS now through March 23, 2018 to save 25% off of everything in the store. 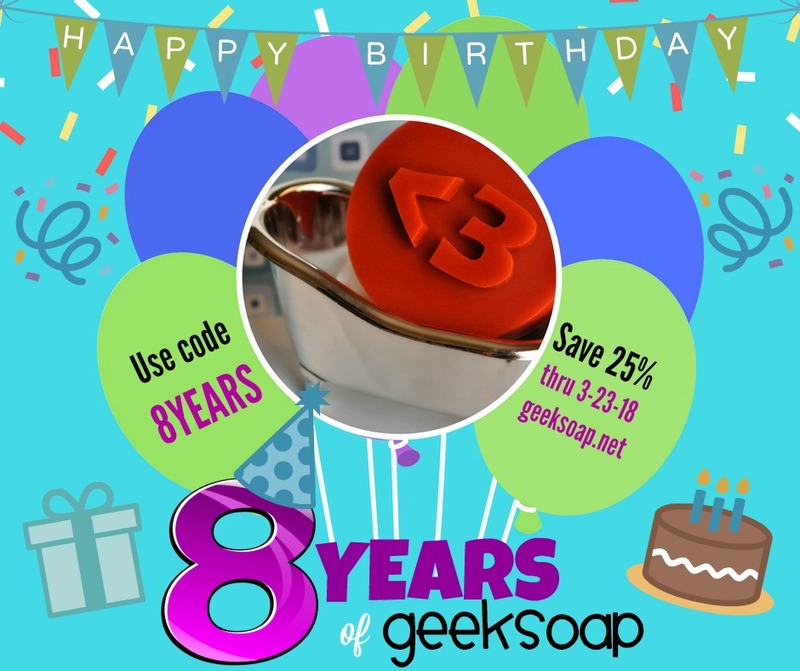 Thank you for 8 geektastic years of GEEKSOAP. Here’s to another 8!